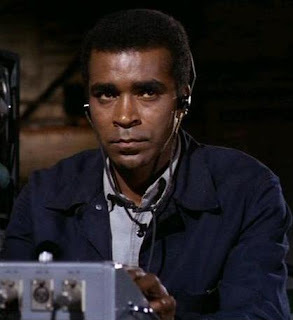 Taking a tip from the classic, "The Transformed Man" by William Shatner, Mission Impossible's Greg Morris treated the world to his version of the "talking song" on an album he released in 1968. "For You" features Morris speaking his way through romantic songs such as "For Once In My Life", "The Nearness of You", "Come Rain Or Come Shine" and "The Twelfth of Never" just to name a few. The liner notes on the back cover start off with "To say that this first album by Mission: Impossible television series star Greg Morris is unique is putting it mildly". Unique is without a doubt the best way to describe this. One might think of the sultry and seductive style of Barry White. Believe me, this is no Barry White album! All I can say is that if mono-tone lyric readings are what you crave, then this album is "for you . . . " Enjoy! Greg Morris-For You . . . 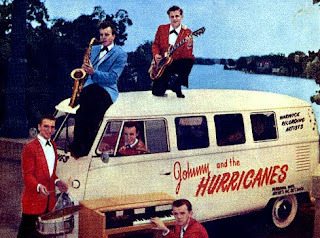 Originally known as The Orbits, Johnny and the Hurricanes burst out of Toledo, Ohio in 1957. Led by saxophonist Johnny Paris, they were school friends who played on a few recordings behind Mack Vickery, a local rockabilly singer. Their first hit on their own was a song called "Crossfire" which they recorded in a vacant cinema to provide echo. It became a nationwide U.S. hit which they promptly followed with an instrumental version of "Red River Valley". That became a Top Ten hit on both sides of the Atlantic and sold over a million copies. They chose these songs because they were well recognized and easier to accept with the rock and roll beat of the accordion which then led to the Hammond Chord Organ. Johnny Paris and the Hurricanes were the first rock and roll group to introduce these instruments to the rock and roll world. Here, straight from my father's singles collection, is that great version of "Red River Valley". Complete with it's flip side, "Buckeye", here's Johnny and The Hurricanes with "Red River Rock". Enjoy! The story of Pygmalion has been told and retold so many times that it's hard to keep track. The adaptations range from classic comedy (The Three Stooges in Hoi Polloi) to brilliant stage musicals (My Fair Lady). The strangest and, in some people's opinions, the worst adaptation of Pygmalion is the 1984 film, "Rhinestone". This time around, the part of Henry Higgins falls into the able hands of Dolly Parton as a country music superstar. Her "experiment" is the one and only Sylvester Stallone portraying the part of an obnoxious New York City cab driver. The spin is that she can turn Sly into a country music sensation. Why they ever green-lit this project in the first place is beyond me! What's even worse is that Stallone turned down the starring roles in both "Romancing The Stone" and "Beverly Hills Cop" to do "Rhinestone". The one saving grace for this film is the soundtrack. 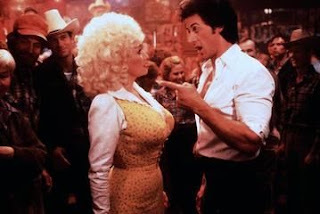 It gave Dolly two more top ten singles and it also gives us not one, not two but four duets with her and Stallone as well as a classic Stallone solo track! Those are worth the price of admission in my book. After listening to this, I guarantee that you will never pass judgement on Sly's brother, Frank, again. In fact, after listening to this soundtrack, you may think that Frank Stallone should get a lifetime achievement Grammy! Here is the soundtrack to "Rhinestone". Enjoy! In 1975, Chuck Berry would release his final album on Chess Records. It was simply named Chuck Berry. The UK version of this album is called Chuck Berry '75 and has an extra pink '75 on the cover. Due to this, the album has become forever known as "Chuck Berry '75". The album contains a selection of Blues, Rhythm & Blues, Rock 'n' Roll and Country standards including Swanee River, I'm Just a Name, I Just Want to Make Love to You, Hi Heel Sneakers, You Are My Sunshine, My Babe, and Don't You Lie to Me among others. I recently popped this puppy onto the turntable and what I heard amazed me. This album rocks! It is simply awesome. If you love Chuck, or if you just plain like Rock and Roll, you need this album. 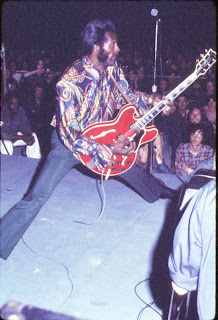 Here is "Chuck Berry '75". Enjoy! Louis Prima was a class act. Disney knew this and in 1967 they tapped him to be the voice of King Louis in "The Jungle Book". 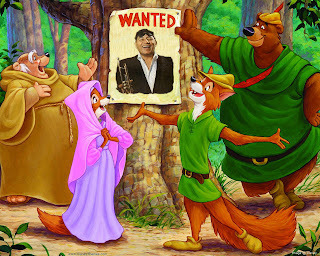 However, it was a few years later in 1973 that Prima recorded an album to coincide with the Disney film, "Robin Hood". Prima did not voice any of the characters in that film nor did any of the songs on that album appear in the film. However it was still pretty cool. And not only did the album feature Louis telling the story and singing the songs, but it also featured the great Sam Butera and The Witnesses backing Louis. Here is that classic Disney record for you! Here is "Let's Hear It For Robin Hood"! Enjoy! 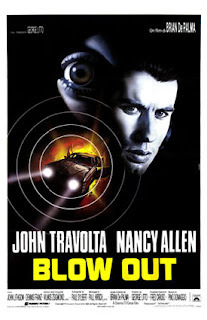 I just finished watching the classic Brian Depalma flick, "Blow Out". I hadn't seen it in years and I was so psyched to see that it still holds up after all this time. If you've never seen it, it's a definite must for you to put it on your list at Net-Flix or wherever you get your films. I've always been amazed that when people talk about John Travolta's career, they never mention this film. I consider it to be one of his best. What adds to it is the fact that Travolta suffered from insomnia during the shoot. His lack of sleep helped him create a very moody performance and is why his character seems so downtrodden throughout the movie. His work in this film is what made Quentin Tarentino cast him in Pulp Fiction, the film that revived Travolta's popularity. The score by Pino Donaggio is absolutely amazing. In fact, it calls to mind the work of Joseph Harnell from "The Incredible Hulk". Here is that amazing soundtrack for you. Here is "Blow Out". Enjoy! I just recently started playing with a really cool swing/rockabilly band called The Shiny Lapel Trio. You've probably heard them and never knew it. They've provided the music for two national commercials for Kohl's Department Stores. Anyway, the band is heavily influenced by acts such as Dean Martin, Louis Prima, Elvis, and Brian Setzer. In fact, the guitarist loves Setzer so much that he even plays a Brain Setzer Model Gretsch Guitar. It made me break out some old Setzer as well as some recent stuff. One of the cooler items I have in my collection is a bootleg of a concert The Brian Setzer Orchestra did in 1998. I was thinking that it wasn't that long ago but I now realize that it is over ten years old. My, how time flies! Anyway, this exceptional sounding concert is today's sharity. 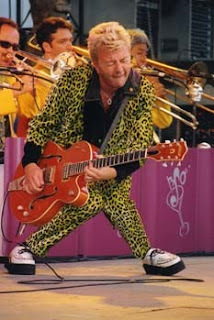 Here is "The Brian Setzer Orchestra: Boston 98". Enjoy! Here's one of the Kohl's commercials featuring The Shiny Lapel Trio. In case you have been living under a rock the past week, Jay Leno and Conan O'Brien are in a battle royal over the coveted 11:35 PM time slot on NBC TV. I don't usually get political on this blog but in my opinion NBC is screwing Conan royally. I am a bit biased as I have friends who work at The Tonight Show who will lose their jobs because of this, but I really don't understand why NBC is so in love with Jay Leno. Conan has not been given a decent chance at the helm of the greatest late night show in history and he's being ousted for the return of someone who failed miserably in a brand new show. 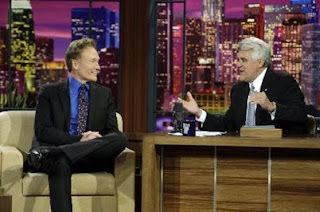 There are those who say that Conan's ratings were bad as well but even NBC has stated that that may be from the weak lead in due to people turning their channels to get away from Leno at 10:00. There are also those people that are voicing their opinion saying that these two guys are going to both make out in the end as Conan stands to make a huge profit if his contract gets pulled. But let's think about everyone who works for Conan. They just recently packed up their lives and their families' lives and moved from New York to California. Now, a mere months later, they are left with no job. Not to mention that they will not be making a huge sum of money the way Conan will if it all falls apart. I think NBC is making a big mistake. All of this makes me miss the days when it was a class act. 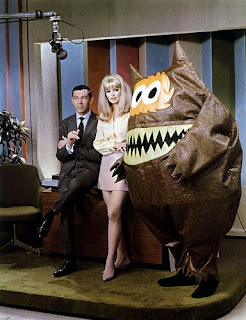 I am of course talking about the reign of Johnny Carson. He was the true King of Late Night and no one can take his place. During the Carson years, the Tonight Show was more than just an advertisement for the latest movie or tv show. It was an honest to goodness form of entertainment. People were invited on the show because Johnny wanted them on. Not because they had a new movie or a new sit-com or even a new record. It was just people that were on because Johnny felt that they were interesting and people wanted to see them. It was a lot cooler and as far as I'm concerned, it will never be the same. In 1974, Casablanca Records issued a collection of some of the best moments of the Tonight Show on a two record set entitled, "Here's Johnny: Magic Moments From The Tonight Show". It features a roster of guest stars that would rival any late night show: Lenny Bruce, Groucho Marx, Ike & Tina Turner, Bette Midler, Lucille Ball, Pearl Baily, The Smothers Brothers, George Carlin, Billie Holiday, Glen Campbell, George Burns, Buddy Hackett, Jack Benny, Dean Martin, Desi Arnez and more. Here is that two record set for you to enjoy! In honor of the release of my new single, "Tattered Clothing", here is an episode from the classic series! Enjoy! All proceeds from the sale of this single will go to The Richard S Dart Memorial Arts Scholarship. 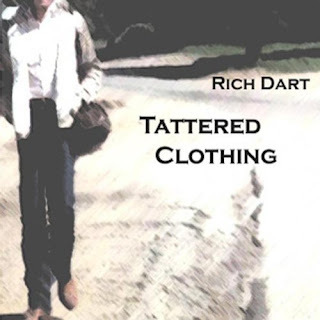 Today marks the release of my new single, "Tattered Clothing". I wrote the song about 5 years ago and recorded it in various cities over the last year of the Avenue Q Tour. It features some great playing by some great players. It is an ode to the 70s television classic, "The Incredible Hulk". It is available on I-Tunes & Amazon and will soon be available on Rhapsody, Napster, emusic and Lime Wire. All proceeds from the sale of this single will go to The Richard S Dart Memorial Arts Scholarship. I had originally wanted to post this on New Year's Eve but time kind of got away from me and I didn't have it ready. So, I thought that it would make a great addition to the Elvis Birthday Celebration instead! Here is what many consider to be one of the best shows that Elvis ever put on. It's from December 31, 1976. The place was the Pittsburgh Civic Center in Pittsburgh, PA. It was the final show of Elvis' 27th tour. This tour has gone down in history as being probably the best tour he did. It featured such great shows as "A Hot Winter Night In Dallas" and "Burning In Birmingham". I posted the Dallas show in December of 2008 (you can check that out here) Nobody can really know what happened to Elvis in this particular moment of his career, but whatever it was, was strong enough to make him wish to please everyone in the crowd and prove to everybody that he was the truly greatest singer of all time. This particular recording holds a special place in my heart. 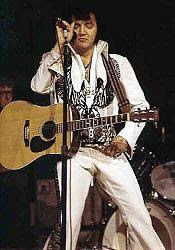 It is an audience recording and as most of you know, I am not a huge fan of audience recordings as there are so many great sounding sound board recordings from Elvis' shows. This one, though far from a great sounding recording, is special to me because I inherited the album from my father. I remember when my dad came home with this record and I will always remember how great it looked. I always found the art work to be really cool for some reason. It was the first time that I had ever encountered a bootleg recording and my father was very good at explaining what it was. Over the years, I have amassed quite the collection of Elvis concert recordings and I always turn away the audience recordings. This one, however, will be in my collection forever. Here is that classic recording of that classic concert! Here is "Rocking With Elvis New Year's Eve". Enjoy! Here is some amateur film footage from that very concert! Enjoy! Today would have been Elvis Presley's 75th birthday. It's pretty amazing to think that he is still an icon to this day. Millions of people flock to Graceland and get caught up in the excitement of it all and even if you are not a fan, you somehow become one by the time you have left the house. I have been there many times and each time it gets better and better. 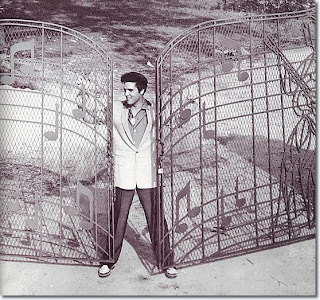 To help celebrate the King's birthday today, I am posting the audio tour from Graceland. For those of you who have been there, it's a great way to relive going through the mansion. For those of you who have not, it gives you a good sense of what goes on in the tour and will hopefully make you want to go see it for yourself. Keep checking back during the rest of this week as I will be posting more Elvis goodness! For now, here is The Graceland Audio Tour! Enjoy! 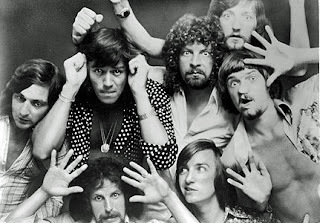 It's hard not to love ELO. The list of hits are astounding and you can actually trace the change in popular music from the seventies to the eighties through their hits. The same band that was doing lush string arrangements with falsetto harmonies in songs like "Telephone Line" would drop the strings and harmonies and lower their voices and give us some good old rock and roll. In fact, their 1983 hit single is entitled, "Rock and Roll Is King." The song went through many changes during recording and at one point was going to be called "Motor Factory" with a completely different set of lyrics. The single proved to be ELO's last UK top twenty hit single, and reached #19 in the U.S. It is and always has been one of my favorites. Here it is for you now. Here is ELO with "Rock and Roll Is King". Enjoy! This month, Dartman's World of Wonder starts it's fifth year! I am truly amazed that it has been that long since I first decided to share all of my wonderful artifacts from pop culture with the world. What's even more amazing is that with each year, the World of Wonder gains more and more followers and fans and I am truly honored and surprised at all of it. To kick off this fifth year, I am posting an album from one of my all time favorite artists, the great Ernie Kovacs. "The Best of Ernie Kovacs" was not released in Ernie's lifetime but came about in the seventies as an audio remembrance of the great television pioneer. It features some of the greatest bits from the long running "Ernie Kovacs Show" as well as some of the great music used on the show as well. (most of the music would eventually see the light of day on a CD compilation released in the 90s). I was incredibly happy to find this album at the college radio station that I worked at back in my academic years and was even happier to relieve the station of it when they decided to go to an all CD format and get rid of their records. I now get to share that album with you! 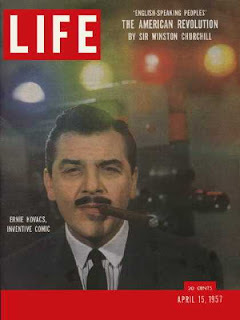 Here is "The Best of Ernie Kovacs". Enjoy!